Smart Allergy Friendly Education: Flatout Thin Crust Flatbreads - Just Made Our Allergy~Friendly Pizzas Even Better! 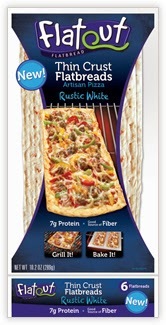 Flatout Thin Crust Flatbreads - Just Made Our Allergy~Friendly Pizzas Even Better! Just found a new thin crust pizza option which will definitely become a staple in our home on those nights I don't feel like making our own. 7grams of protein, thin crust and it tastes great! I have used this brand before and feel confident with their allergy labeling. It doesn't state they are nut-free, egg-free or dairy-free, but none of these items are in their ingredient list. Flatout Flatbread Review from S.A.F.E. They made our Friday night pizza and movie night stupendous! The ONLY complaint was that I didn't make enough! How was I to know that one full flatbread slice wouldn't be enough? Ingredients include: ENRICHED FLOUR (WHEAT FLOUR, MALTED BARLEY FLOUR, NIACIN, IRON, THIAMINE MONONITRATE, RIBOFLAVIN, FOLIC ACID), WATER VITAL WHEAT GLUTEN, SUGAR, CONTAINS LESS THAN 2% OF EACH OF THE FOLLOWING: SOYBEAN OIL, OAT FIBER, SODIUM ACID PYROPHOSPHATE, BAKING SODA, YEAST, SALT, PRESERVATIVES (POTASSIUM SORBATE AND SODIUM PROPIONATE), FUMARIC ACID, CALCIUM SULFATE, ENZYMES. CONTAINS: WHEAT AND SOYBEANS. MANUFACTURED IN A FACILITY THAT ALSO PROCESSES PRODUCTS CONTAINING MILK. Be sure to visit their website to learn more, such as: where to find them, Flatbread Store Finder, Recipes and more about their Products. 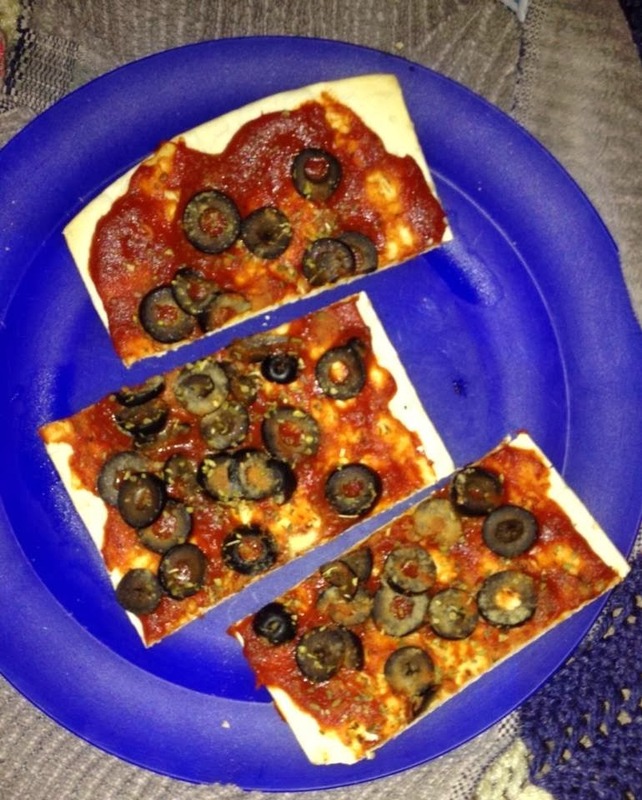 Flatout Flatbread Pizza with Olives - from S.A.F.E. I have been a fan of Flatout Flatbread for several years. Since we don't add cheese, we add lots of sauce for all of our toppings. I think this brand is great because they don't get soggy when baking them. Mine included olives, fresh tomatoes, and peppers! Delish~ One full flatbread easily slices into 3 to 4 mini slices. Hopefully, this option may be a possibility for your home. Be sure to call them directly if you have more questions.